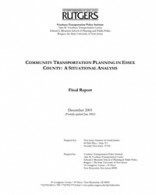 This study examined the history of community transportation planning process and implementation of welfare-to-work transportation services in Essex County. Research tasks included a national literature review for “best practices,” a review of New Jersey statewide community transportation planning initiatives and a series of key informant interviews to ascertain the current state of planning and implementation in Essex County. (Client: New Jersey Institute for Social Justice) July 2001.